Copic markers to shade the green leaves. Allow me to share with you a card bound to make you smile. I cut the flower pot, stem and leaves for this (as a paper piecing) from an SVG file from Diecut Designers. Their file also includes a paper daisy atop the stem -- which I just manually cut off of the SVG cut (with my scissors, not the program -- just to be quick!). I cut off the flower because I wanted to feature a cute fabric flower I made. I've purchased the sweet fabric to make a dress for baby Charlotte, and wanted to make some matching flowers that I'd use on a headband or to embellish the dress, eventually. This flower uses 5 pieces of fabric, each cut unto 3" squares. I folded each in half to make triangles, and basted a loose stitch along the open edges. I gathered up the stitch and it formed a petal that I firmly stitched to hold. Then, without trimming the thread, I added the next petal with a loose basting stitch, pulled it taut and also secured it. And so on, until all five petals were in a neat circle. To hold it all together as I wanted it, I just stitched more to hold, in a star pattern on the back side of the flower. 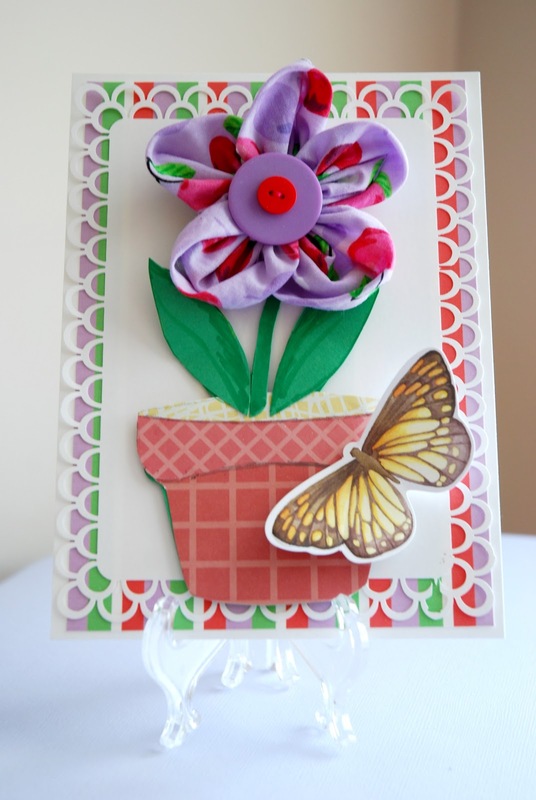 I topped the flower with two matching buttons, and added an "alligator" clip to the back of the flower. I punched a hole in the card so I only had to clip the flower to the card. This makes the flower reusable later when Charlotte's mom Emily wants to clip the flower to a headband or hat. I also think this would make for cute packaging for your fabric flowers sold at craft shows, and would likely increase the price you could get for the flower. What do you think?